At The Crack Of 1pm . . . I took down our La Crosse Weather Station’s anemometer from where it was mounted on a pole zip-tied to the rig’s rear ladder. Next up was to check on the rig’s house batteries. I had put off doing them on Wednesday when I found I was out of distilled water. But then today I found that I didn’t need the water since all four batteries were filled right up the tippy top. I also added a big scoop of laundry soap and some Calgon Water Softener to our almost-full black tank. That way during our drive tomorrow everything can slosh around and clean out the tank. Then I’ll dump everything when we can get back to the park. A little before 5pm Jan and I headed over on FM646 to have dinner at our favorite Pho 20. It’s been a couple of weeks since we’ve been there, and they went and changed the menu on us. Luckily for us, it was for the better. Rather than take away dishes we like, like some places, they’ve added new ones. And it was a new one that quickly caught Jan’s eye. And now it’s her new favorite dish there. 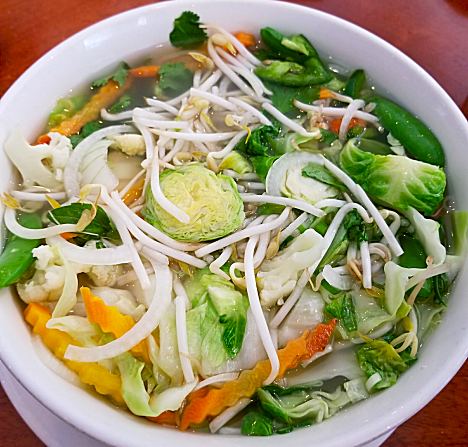 I once again got the White Meat Chicken Pho with Veggies. 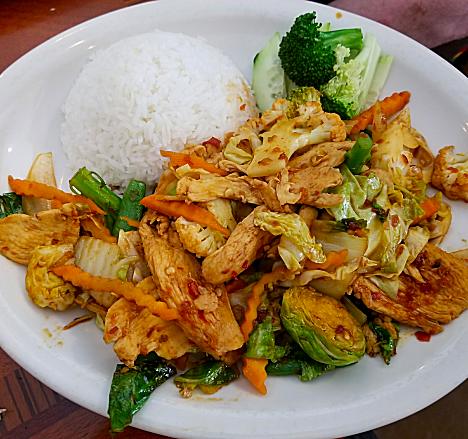 One thing like about this dish is that every time it’s a little different, or at least the veggies are. When I ask I was told it all depends on what’s fresh and looks good at the market. So this time, as well as the usual carrots, broccoli, cauliflower, cabbage, etc., I also got Brussels sprouts and snow peas. Really Delicious. I’ve mentioned before that Sherry, the owner of Pho 20, always finds something extra to send us home with. 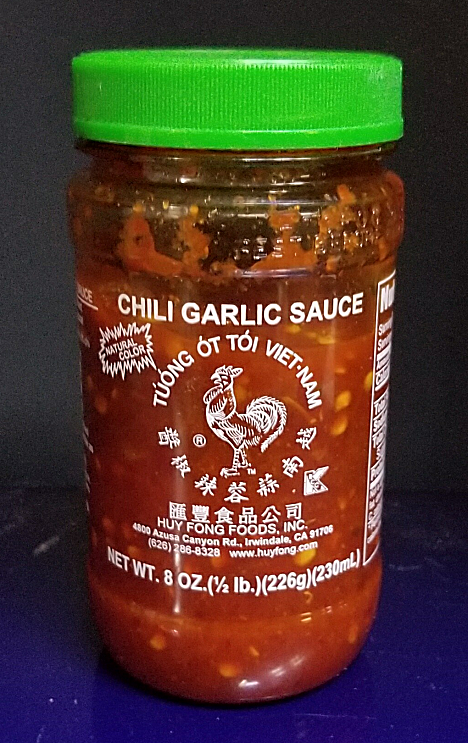 This time it was a big container of their Hot & Sour Soup and a jar of the Chili Garlic Sauce they used to make Jan’s new favorite dish. And from the label it’s made by the same people that make Sriracha Sauce. So it’s got to be good. We’re not in any really big hurry for our 40+ mile trip tomorrow so we probably won’t head out until about 1pm. More than likely it will take us an hour or so, since most it is on State roads and not Interstates. As it stands right now I don’t have a place lined up to get propane so we’ll wait until later for that. Probably the best recommendation for an RV park that I’ve ever seen.